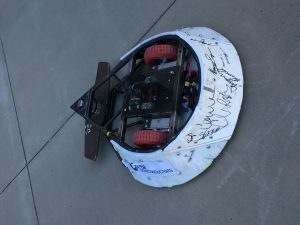 The objective of this contest is for a robot to follow a black line on a white background, without losing the line, and navigating several 90 degree turns. The robot to complete the course in the shortest period of time while accurately tracking the course line from start to finish wins. A kinetic art bot is any mechanical device that has at least one moving part. A kinetic art bot performs no useful function other than entertaining the viewer.